Budweiser has for so long been synonymous with American beer that the company literally renamed its beer “America” for a while. 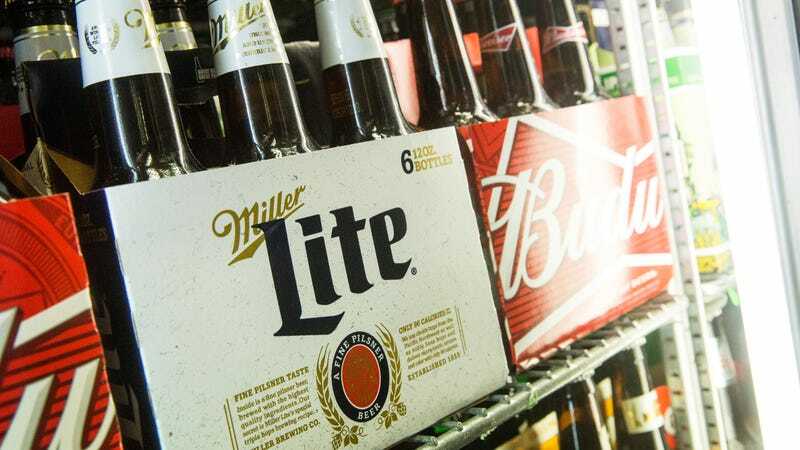 But it only ranked as the number three best-selling beer in the U.S., until—in what’s been described as a beer-industry shocker—Miller Lite dethroned the King, according to 2017 sales data analyzed by Beer Marketer’s Insights. That means that for the first time, the top three best-selling beers in America are all light beers. While this tidbit has garnered beer-industry headlines, it’s not completely out of left field. As The Washington Post notes, Budweiser sales have been shrinking for decades, now totaling just a third of what they were in 1988. It’s not just Anheuser-Busch’s flagship that’s off, though; Brewbound reports that the category of “domestic premium” beer (Budweiser, Bud Light, Miller Lite, Coors Light, etc.) sees its volume sales down almost four percentage points last year. All those players are just vying for supremacy over a smaller and smaller piece of the pie. So who’s winning, if not the big breweries? Craft breweries’ sales volume continues to rise, though not at the double-digit rates those plaid-clad renegades enjoyed at the beginning of the decade. Just over 12 percent of all beer consumed in the U.S. fits the Brewers Association definition of “craft”, which excludes Goose Island, Elysian, and other breweries purchased by Anheuser-Busch or other mega-companies. A bright spot in the beer world are Mexican imports like Corona and Pacifico, whose big sales gains have made them the new hotness, and not just among Hispanic drinkers, either. But where beer really faces a threat is from wine and liquor, who have been taking market share from brewers for seven straight years. The “why” portion of that continues to vex brewers. At a beer distributors’ convention last year, Brewbound reports that Anheuser-Busch CEO João Castro Neves gave a few possible explanations for the shift: Namely, wine and spirits are reaching just-legal drinkers earlier than they used to, and wine and spirits are innovating and marketing better than beer. All this adds up to the surprising revelation that 2018 is actually an amazing time to be a beer drinker. If you like the low-calorie stuff, obviously you’re in the majority. But if you prefer other types of beer, breweries have to compete for your dollars like never before. This keeps prices down and innovation high, since no brewery can afford to rest on its laurels. And that’s a development worth toasting.